Pfeiffer Vacuum opens new high-tech production site in Romania. Cutting the ribbon at the inauguration ceremony. 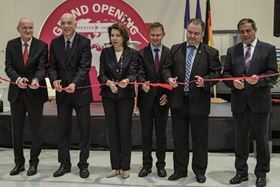 Germany’s Pfeiffer Vacuum has officially opened its new facility in Cluj, Romania for the production and service of components for vacuum pumps. 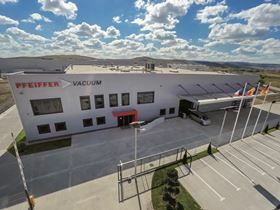 Pfeiffer Vacuum has been operating in Cluj since 2010. The new Pfeiffer Vacuum building, which is located in the Nervia Industrial Park in Apahida, incorporates highly efficient production processes in a 4300 sq m area. The new location in Cluj has 74 employees. The same production and service standards apply in Romania as at Pfeiffer Vacuum’s sites in Germany and France. “The new building has increased our production and service capacity for turbopump and backing pump components. This is part of our new growth strategy including a global investment program with a volume of E150 million,” said Dr Eric Taberlet, CEO of Pfeiffer Vacuum Technology AG. “With modern machinery and plant technology as well as qualified specialist personnel, we are now even better placed to react flexibly. Quality and flexibility are our top priorities,” added Dr Taberlet. Cluj is Romania’s second largest city with around 320 000 inhabitants. As a business location, Cluj concentrates primarily on information technology, electrical engineering and mechanical engineering sectors. Pfeiffer Vacuum receives another major order for turbopumps and turbo pumping stations from CERN.